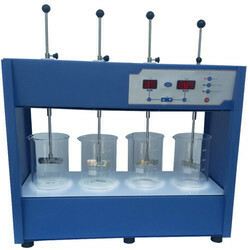 Prominent & Leading Manufacturer from Delhi, we offer flocculator jar testing machine. Flocculator has been specially designed for use in water treatment plants to correctly estimate the dosing of alum and such other coagulants for treatment of water and sewage. In provides identical test conditions for all samples. Illuminated base consists of fluorescent tube mounted below translucent plastic plate to provide diffused cold light through floc sample. Flocculation consists of geared continuous run heavy duty 1/20 H.P. variable speed motor from 10 to 100 RPM with built in speed control. S.S. Stirring rods are provided with adjustable spacer to adjust the depth of stirring paddles. The stirring shaft can be removed without disturbing other stirrers. This unit is supplied without beakers to work on 220/230 volts A.C.
Automatic 0-60 minute "GERMAN" Timer. Microprocessor based digital RPM counter. Looking for Flocculator Jar Testing Machine ?